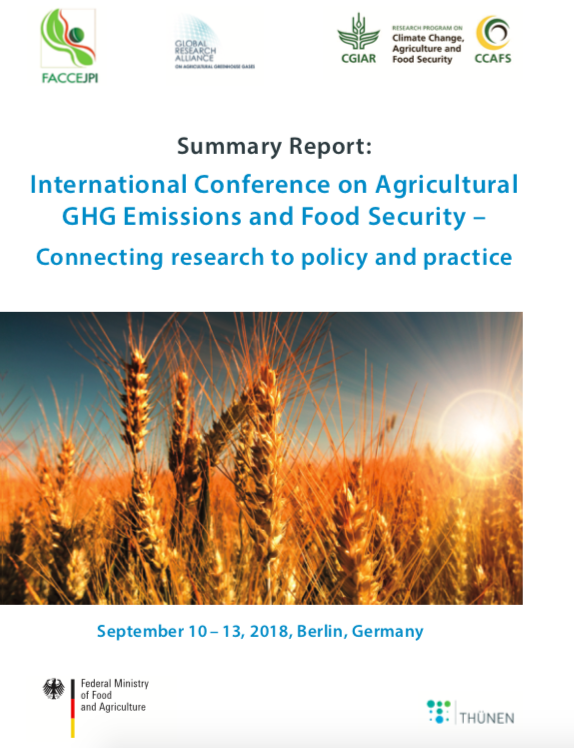 Approximately 300 scientists and stakeholders from government, public administrations, industry and farmer organizations from over 50 countries gathered in Berlin for the “International Conference on Agricultural GHG Emissions and Food Security – Connecting research to policy and practice” to discuss the central question: What are the options and longer term visions to mitigate greenhouse gases and enhance carbon sinks in the agricultural sector while ensuring food security? The conference was sponsored by the German Federal Ministry of Food and Agriculture (BMEL) and organized jointly with the Ministry, the Joint Programming Initiative on Agriculture, Food Security and Climate Change (FACCE-JPI), the Global Research Alliance on Agricultural Greenhouse Gases (GRA) and the CGIAR Research Program on Climate Change, Agriculture and Food Security (CCAFS) and the Thünen Institute, the German Federal Research Institute of Agriculture, Forestry and Fishery. In parallel to the scientific conference, the 8th annual council meeting of the Global Research Alliance on Agricultural Greenhouse Gases present took place.